The moment I made the transition from a sole beauty enthusiast to a complete wellness junkie was the moment I discovered luxury Ayurveda! I was first introduced to the concept with the much pricey Forest Essentials brand some three to four years back. The sheer scope, variety, efficiency, and inherent goodness of the products hooked me to the wholesome experience. 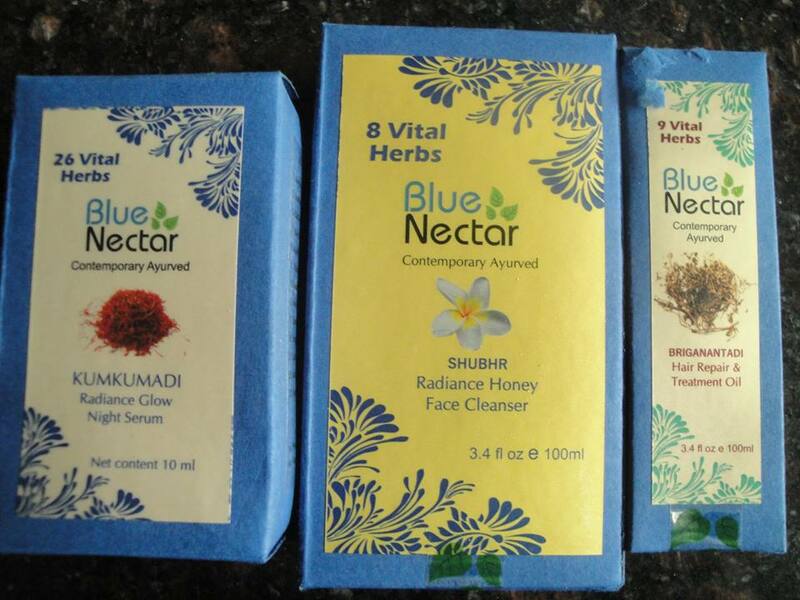 Fast forward to now, I’m happy to announce that Luxury Ayurveda has come out with another promising yet not so pricey brand – Blue Nectar. The brand claims all their products to be pure, free from chemicals and 100 per cent Ayurvedic. Each product is composed of a regal blend of vital herbs like Cinnamon, Turmeric, Shatavari, Bala, Laksha, Harad, Baheda, etc., that offer goodness and benefits for the whole body and mind. 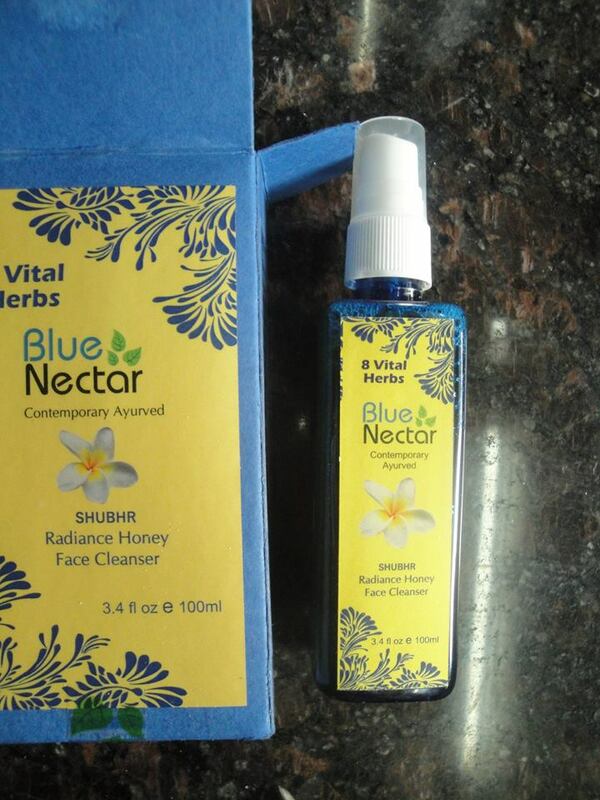 Looking at their aesthetic packaging, I must say all Blue Nectar products practically scream, “I’m from a swanky, high-end spa, and you better acknowledge! Everything about these products, from the packaging to the textures to the scents spell – l-u-x-u-r-y! ‘Shubhr’ means Radiant, Pure White, Bright Colored, The Ganga, Shiny, and Beautiful in Sanskrit. And true to its name, it’s a shiny, clear cleanser with a luxurious scent that leaves a light veil of supple radiance on my skin after it is removed. To know more about this cleanser, read full review, which is coming up soon. Holy paycheck this is pricey! 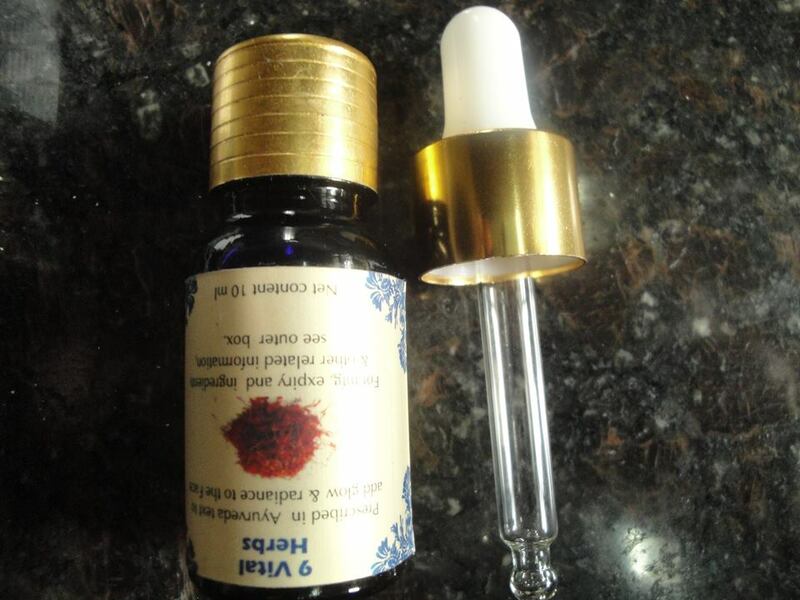 This super scented regal concoction 26 vital herbs like Kumkum, Chandan, Lodhra, Patanga, Agaru, Manjistha etc. is designed to nourish, moisturize, and glow your skin from inside out. I started using this serum only a couple of days back and to be fair, a few days isn’t really a lot of time to be using a product and passing the verdict. So girls, you need to wait for substantial time for an in-depth, accurate review of this luxury night serum. Price: Rs. 425 & 795 for size 100 & 200 ml respectively. Brigantantadi means Bringadi and Anantmool. 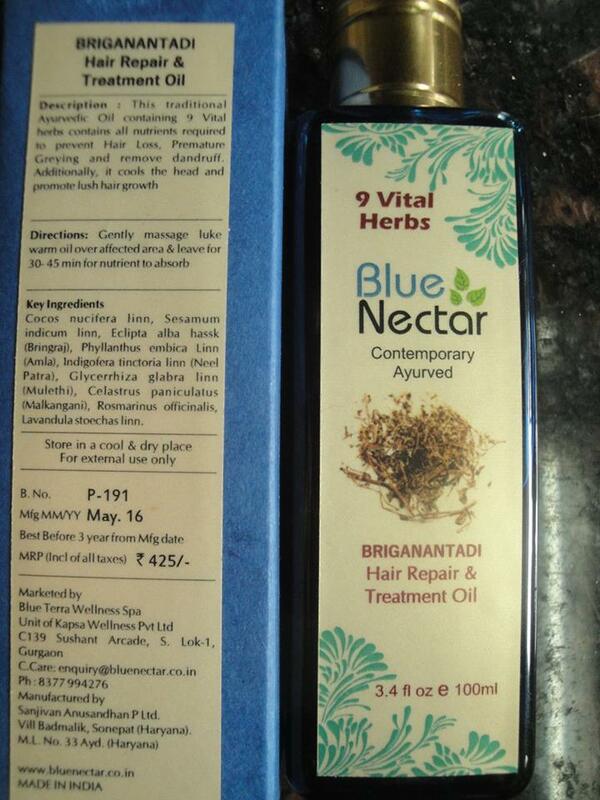 It’s a unique blend of 9 vital herbs like Bringraj, Amla, Neel Patra, Mulethi, Rosemary, Lavendar etc. to arrest hair fall, avoid premature graying and prevent dandruff. In addition the oil also cools the head and is natural conditioner for lush hair growth. While, it’s only been a few days I’m using the products and in this brief span of time, the three Blue Nectar products have allowed me to imagine my small grubby bathroom shelf as a luxury spa to experience an oasis of relaxation and rejuvenation. I’m going to continue to use the three products and keep you guys posted on the results with in-depth reviews. If the claims are true and I really notice change in my skin and hair, I’ll be sure to let you know. Until then, I’m using Blue Nectar range as a luxurious, richly hydrating, spa treat!